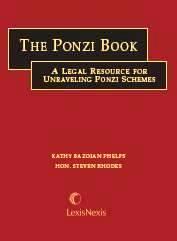 Audio podcast, Legal Issues in Ponzi Scheme Litigation, for the LexisNexis Bankruptcy Law Community on May 1, 2012. Available here. Video, How to Avoid a Ponzi Scheme, with Michael Martin of the Huffington Post. On April 17, 2012, the video was published on the Huff Post Business website. Audio podcast, Bankers That Bank Fraudsters Could Face Costly Liability to Victims, for the Association of Certified Financial Crime Specialists on April 8, 2012. Available here. Video of panel discussion, All's Well That Starts Well: Prejudgment Remedies, for the National Association of Bankruptcy Trustees, Spring Seminar, March 29-31, 2012, in Las Vegas, Nevada. Available here. Webinar, The Costly Collision of Financial Institutions with Ponzi Schemes, on March 15, 2012. Available here. Webinar, Ponzi Schemes, Securities Fraud and Other Fraudulent Enterprises: From "A" (Asset Forfeiture and Avoiding Powers) to "B" (Bankruptcy) to "C" (Coordinating Multiple Court Proceedings), for the Business Bankruptcy Committee of the the American Bar Association Business Section on March 8, 2012. The powerpoint presentation is available here. Video from the Annual Fall Conference of the National Association of Bankruptcy Trustees on September 22, 2011, in Amelia Island, Florida, on a panel addressing Non-Traditional Assets. Available here. Video of a panel discussion on Fraudulent Transfer Claims and Defenses in Ponzi Schemes Cases at the Annual Fall Conference of the National Association of Bankruptcy Trustees on September 29, 2010, in San Francisco, California. Available here.